Students in many schools were specially trained to run film projectors and other audiovisual aids. Silent filmstrips were first used in American schools around 1910, followed by movies about twenty years later. Film was widely adopted for military instruction during and after World War II. In the postwar years, school systems, universities, and private firms produced instructional materials. During the 1950s and 1960s, scientists in several curriculum reform projects saw film both as a way of teaching mathematical and scientific ideas, and as a means of showing students actual scientists conducting experiments. Many science and mathematics curriculum projects prepared films for teachers and for students. 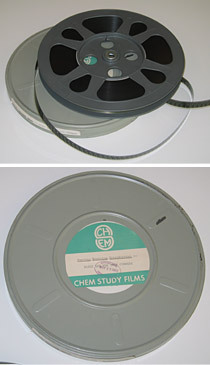 The Chemical Education Material Study began producing movies in the early 1960s. There were some 27 films for students, about a dozen of which had an accompanying film for teachers. This canister contains a 22-minute movie intended to introduce teachers to lessons they would teach on pneumatics. The series would be available, with modifications, into the 1990s. Filmstrips and movies also offered an attractive ways to present mathematical and scientific ideas in the museum. International Business Machines funded the preparation of this series of short animated "peep shows." They were part of an exhibit on mathematics at the California Museum of Science and Industry in Los Angeles. The brief clips discussed topics such as functions, symmetry, powers of numbers, and the calculation of the diameter of the earth.